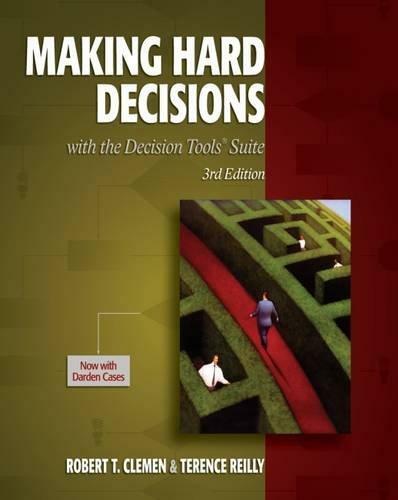 MAKING HARD DECISIONS WITH DECISIONTOOLS® is a new edition of Bob Clemen's best-selling title, MAKING HARD DECISIONS. This straightforward book teaches the fundamental ideas of decision analysis, without an overly technical explanation of the mathematics used in decision analysis. This new version incorporates and implements the powerful DecisionTools® software by Palisade Corporation, the world's leading toolkit for risk and decision analysis. At the end of each chapter, topics are illustrated with step-by-step instructions for DecisionTools®. This new version makes the text more useful and relevant to students in business and engineering. 1. Introduction to Decision Analysis. 2. Elements of Decision Problems. 15. Utility Axioms, Paradoxes, and Implications. 16. Conflicting Objectives I: Fundamental Objectives and the Additive Utility Function. 18. Conclusions and Further Reading. Robert T. Clemen is Professor at the Fuqua School of Business at Duke University. He has been an active contributor to the field of decision analysis since earning his Ph.D. at Indiana University in 1984 and is an authority in the use of expert information in decision and risk analysis. He has interests in applying decision analysis in the areas of energy use and corporate sustainabiligy. Aside from his research interests, Bob has a strong focus on making decision analysis understandable to all students at all levels, ranging from high school students to executives. Terence Reilly is an associate Professor of Mathematics at Babson College. His interests include developing innovative curriculum for MBA programs, particularly distance programs, along with simulation and decision analysis. His research interests are in developing sensitivity analysis techniques and fitting distribution curves to univariate and multivariate uncertainties. Recently, he has developed courses in financial methods using simulation and decision analysis.